My work forms the ongoing mythology of the Border Creatures, a group of hybrid beings that live in the verdant wilderness of the Borderlands. The Border Creatures exist in symbiotic harmony with the natural world, but are frequently antagonized by the Specters, beings of pure energy that casually burn the landscape that they walk upon. When these spirits first appeared, the destruction that they brought to the lush ecosystem of the Borderlands drove the creatures into hiding, and forced them to conceal their hybrid and non-binary nature in order to survive. In my recent solo exhibition, Terra Incognita, I chronicled the heroic journey of Healer, the leader and savior of the Border Creatures. By donning the Fatherdress, a supernatural garment that allowed Healer to become both mother and father to the creatures, the Specters were transformed, and Healer's people saved. However, there are still Specters that haunt the darkest corners of the Borderlands, and the Spectral Witnesses that beheld Healer's transfiguration still wander the forest. Adrian Cox (born 1988) is a painter living and working in Los Angeles, California. Cox attended the University of Georgia for his undergraduate studies, and received his Bachelor of Fine Arts degree with honors in 2010. He obtained his Master of Fine Arts degree from Washington University in Saint Louis in 2012. From 2014 to 2018, Adrian oversaw exhibition programming at the Millitzer Gallery, an alternative art space in Saint Louis, Missouri. Adrian has exhibited his work nationally and abroad, including at the Mildred Lane Kemper Art Museum, the Contemporary Art Museum Saint Louis, Corey Helford Gallery in Los Angeles, Beinart Gallery in Melbourne, and 111 Minna Gallery in San Fransisco. Adrian Cox is a painter, scholar, philosopher and one compelling teller of stories. His paintings depict a vast and secret world of peaceful ‘border creatures’ which exist within a serene and tranquil ecosystem, known as the Borderlands. Cox’s body of work represents a mythology, a mythology that he has thoughtfully, meticulously and incrementally evolved. Like so many mythologies, though the central characters may not be human, the message is nevertheless ultimately a human one: an allegory for who we are, what we came from and what could perhaps one day be. For his next exhibition, “Sensory Garden”, Cox wanted to paint dreams, desire and the quest for knowledge and self-understanding. “Sensory Garden” opens at BeinArt Gallery in Melbourne on 3 June 2017. Luke Barrett: Adrian, there’s a lot of excitement about your upcoming show at BeinArt Gallery in Melbourne, Australia and I understand this might in fact be one of your first solo shows outside of the United States. That said, Melbourne collectors have felt rather spoiled in recent times, with a number of your works appearing in group shows here over the last couple of years. Is there a story there, about how your art started making fairly regular pilgrimages to Melbourne? 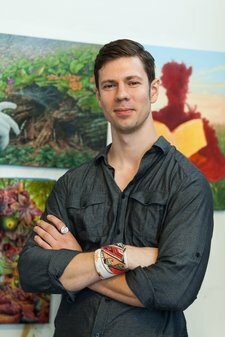 Adrian Cox: I think Jon Beinart first became aware of my work through online features that I was receiving, but he reached out to me after seeing a painting of mine in person at Corey Helford Gallery in Los Angeles. My work reproduces well digitally, but as you well know, there’s a lot that goes on in my paintings that has to be seen in the flesh; not only in the amount of details, which I’ve tried to push to a new level in this exhibition, but also in the way that I layer transparent colors to create lighting effects. Since seeing my work in person, Jon and Corinne have been incredibly supportive in providing me with a platform to show new paintings, particularly with this new exhibition! LB: As it turns out, I was with Jon and Corinne Beinart when the crates of your new works started being delivered. When we started breaking open the crates, one of the things that struck me was the sheer number of paintings that you have created for this next exhibition. As an artist, what is it like to invest so much time and creative effort into preparing for an exhibition, only to pack them all up and ship them to the other side of the planet? Do you ever experience an attachment to your pieces, or are you fairly good at setting them free, releasing them into the wild, so to speak? AC: Shipping work out is always a little nerve-wracking, but I honestly can’t think of anything more exciting than releasing these new paintings into the world. As you can imagine, my work takes a considerable amount of labor to make, so I’ve pretty much been living like a hermit in my studio for the past few months. Although I become very personally invested in my work during this part of the process, a painting isn’t really complete for me until it’s seen the light of day. One of the most gratifying parts of my artistic practice is getting to see how people connect to the world that I’m building! And I’m thrilled to be able to visit Australia and see the show in person! LB: I understand that you hold a bachelor and masters qualification in fine arts. What is involved in achieving those qualifications? Were your studies focused mostly on the history of art, interpreting art, the different techniques or the actual act of painting itself… or all of the above? Do you think that your studies have influenced your own art, or do you think that you would be painting your border creatures today even if you had never enrolled in fine arts? AC: My undergraduate education was definitely focused on technique and the study of art history, while my graduate degree was more specifically geared towards understanding the conceptual context of an artistic practice. I hear a lot of artists complain about the lack of structure and classical training in art schools these days, and while I have to admit that I earned much of my technical knowledge the hard way, I truly believe that my education shaped my trajectory. In particular, individual professors and peers have been far more influential on my path than the institutional structure of academia. I’ve been lucky enough to encounter many friends and mentors in my life that have generously shared their knowledge with me, and I think this may have something to do with why I now teach as a professor myself. There’s also a feverish exchange of ideas amongst peers in art school that’s hard to match. Although the graduate school that I attended was an interdisciplinary program, there was a camaraderie amongst the painters. We pushed each other to better understand the historical and philosophical foundations of our medium, and we were the better for it. The first images of the Border Creatures emerged from this setting, and were the product of a heavily philosophical investigation. While these first works were the bones of what I make now, they tended to be overly serious, and it was only by stepping away from the intensity of an academic setting that I was able to give my work the playfulness and inner life that it needed. LB: On social media, you shared that you have been experimenting with some new techniques for this exhibition. Can you elaborate on those new techniques and what people can expect to see? AC: I always like to ride the edge of my limitations in painting, to push myself just beyond what I think I’m capable of. A friend of mine that I share a studio space with always jokes that I like to torture myself with my work, and he might be a little right. There’s something exhilarating about setting out into the uncharted waters of painting. In this exhibition, that meant focusing on color and atmosphere. I don’t want to get too into the weeds when I talk about process, but many of these paintings began as highly saturated underpaintings. I blocked in the figures in monochrome violet or blue, and layered the background landscapes on top of intense washes of color. In the figures, I had to flesh out the color through several layers of glazing, and the end result shimmers with a depth and luminosity that opaque paint just can’t achieve. In the case of “Glow Gardener with Nocturne,” I actually used this process to create the illusion that the figure is glowing. On the other hand, in some paintings I played with mixing this glazing process with more direct methods of thick, opaque applications of paint. Much of the foreground in “The Dream” was applied with a palette knife, and I ended up dragging and scraping away a ridiculous amount of paint before it was finished. The goal in this particular painting was to set up a contrast between the airy and transparent fantasy of the background and the earthy “reality” of the foreground scene. LB: One of the things which I love about your work, are the wonderfully intricate and meticulously created backgrounds. They really do play a big part in the aesthetic that defines your paintings. If I can use a musical analogy, sometimes in life it is easy to focus on the lead singer, but it’s only when you look back on, say, a band like The Smiths and the solo careers of Morrissey and Johnny Marr, that you realise that something really ‘special’ was lost when you separated the front man from the band behind him. I have noticed that sometimes artists, perhaps in an effort to meet increasing demand for their works, and in the strive to maintain prodigious rates of output, start compromising on the backgrounds and landscapes in which they depict their protagonists: they kick Johnny Marr out of The Smiths, to continue with the analogy. How do you psyche yourself up to take the time required to create the level of detail in your works? AC: Ha! That is a fantastic analogy, and a perfect explanation for why I still spend hours and hours of my life painting blades of grass! For me, art history is a balm of sorts when I’m feeling frustrated or burnt out. When I start to really struggle with the work I’m making, I open one of my books and just absorb the images inside. There’s something reassuring about the sheer volume of paintings that some of these artists were able to make in their lives, and I’m always trying to crack the code of how to work more efficiently, how to speed things up without compromising my work. Sometimes, this means methodically timing the layers of multiple paintings at once, and sometimes this means painting furiously while blasting very loud, very fast music. LB: For this next exhibition, you have created pieces of various sizes and dimensions – and some are really quite large. How do you decide on scale? Is it a case of wanting to have pieces of different sizes, and then creating an image that is suited to each size? Or does the idea come first and you choose the size that works best for the idea? Because I imagine it’s not about needing extra space for extra detail: even your smaller pieces have an amazing amount of detail. AC: My work often begins with me jotting ideas down in lists, just short and simple written descriptions of possible narratives. The initial stages of planning this show involved grouping the ideas that seemed the most thematically or visually linked, and eliminating those that seemed out of place. Mostly, I had an idea of what was going to be in the show before I even began sketching. I also knew that the large works would serve as conceptual and emotional anchors, and would frame the way the rest of the show would be read. So, I mostly used narrative tone to determine size. It seemed fitting that I use the romantic saga of Painter and Snake Gardener and the earnest musical passion of Glow Gardener as an emotional exposition of sorts. LB: If you don’t mind, I’d like to take a deeper dive into the world of your Border Creatures now, a world inhabited by recurring characters, including the likes of Big Thinker, Veiled Healer, Snake Gardener, Dreamer and Painter. Do you think your paintings will always revolve around the Border Creatures, or can you see yourself retiring them or exploring other themes and protagonists in parallel? AC: I definitely feel that the narrative and visual potential for this work is rich enough for me to mine for years, but I can’t say for certain where things will head in the future. For me, the world-building and storytelling that I engage in when I make my work allows for a lot of adaptability and possible change. I’ve never been one to completely abandon a body of work, but I could easily see the world of the Border Creatures expanding, and possibly, over time, even evolving beyond recognition; I always leave open the possibility of surprising myself. Despite how long I’ve been developing these characters and paintings, I still feel that I’m building out the exposition for their story. But I see any movement forward in my work as a way of advancing the mythology of these characters, a mythology that has, until recently, remained fairly vague and mysterious. LB: You describe the Border Creatures as being part of a mythology that you have created. Is there a grand narrative that you have in mind, a comprehensive story arc that binds all of your paintings together or – if not all of them – is there an underlying narrative for the lives of the main, recurring characters? If so, do you already know how it all ends for particular Border Creatures or how their lives are going to unfold within the mythology? Or does each piece stand alone, independent of the other paintings? AC: The work that I’ve been making for the past few years has a sort of narrative stillness between paintings; characters develop relationships, tiny dramas unfold, but mostly things remain constant. This is because I’ve been depicting a Golden Age for the Border Creatures, a period of pastoral harmony. They live in perfect balance with the Borderlands and each other. So in a way, most of the paintings in this exhibition can be seen as individual genre scenes within the broader context of an age of paradise. But this kind of perfection can’t last, and I think there’s a tension beginning to develop around the work that suggests the possibility of monumental, or even catastrophic change on the horizon. Over time, followers of my work might start to pick up on a larger narrative arc, but for me, the saga of the Border Creatures has only just begun! In a sense, I’m discovering this story as I go, uncovering new directions as I follow my instincts. But there are still strong conceptual currents that keep things in line as I go. LB: I remember the first time I saw your paintings in person, I remember the uplifting, emotional connection which I felt straight away. Let’s face it, the Border Creatures don’t resemble anything that anybody would be familiar with (except perhaps for the keenest follower of Arcimboldo); but you can’t help but be touched by their tranquility and gentle, peaceful nature: there is no reason to be afraid of them, you can tell they are friendly. These are ideas which – growing up in the 80s and 90s – we were exposed to through characters like the Rockbiter in 1984’s NeverEnding Story and Guillermo del Toro’s faun and fairies in 2006’s Pan’s Labyrinth: when it comes to people, you just can’t judge a book by its cover and expect to be right. Is this a theme that you intend people to see in your work? AC: Yes! If I had to sum up the single most important tenet that guides the decisions in my work it would be “empathy for the Other.” I allow myself a lot of room to play with how I depict the Border Creatures, but I never show them as threatening or overly alien; it’s important for me to cultivate the possibility of a real and positive connection between a viewer and the figures that I paint. Even at their most grotesque, the Border Creatures offer themselves as vulnerable, sensitive, and, ultimately, very human. Obviously, there’s a certain artistic distance between the fantasy in my paintings and the reality of everyday life, but I’ve always tried to use my work to speak to a contemporary human experience. I think that now more than ever, people are sensitive to the ways that we build divisions, the ways that we mark groups of people as undesirable, as unknown and unwanted. So, in a certain sense, the vision that I’m crafting suggests an alternative path, another way that we, as humans, might view and treat each other. LB: Most people “feel” like your characters are either male or female: Veiled Healer feels female with her floral crown, Big Dreamer seems male with the large stamen protruding from his lap, and Snake Gardener seems female with her, shall we say, ample bosom. But maybe this is an overly human-centric view of the world, and teaches us something about our ourselves and our own tendency to rely upon – and therefore to be vulnerable to – stereotypes. Maybe this is just a case of humans seeing human shapes in the clouds, as it were. What is your view on the role of gender – if any – in the world of the Border Creatures? AC: I’ve always been particularly sensitive to how I portray gender in my work, and I think on a personal level that this might have something to do with growing up with two mothers. Because of my life and my background, it’s always seemed very natural to me for gender roles to be fluid and even interchangeable. This is certainly something that not everyone is comfortable with, but as I’ve said, empathy is key, and difference is nothing to be frightened of. LB: One of my favourite pieces in your upcoming show is “Snake Gardener with Orrery”. An orrery, of course, is a mechanical model of the solar system. I love the idea of Snake Gardener using a lantern to represent the sun, and eight pieces of fruit placed around it to represent planets orbiting the sun. Now, science buffs will know that, ever since Pluto lost its status as a planet, there are only eight remaining planets in our solar system. Is this a clue that, in your mythology, the Border Creatures inhabit the Earth or at least a planet or moon in the same solar system as us? AC: Absolutely. It’s one of the ways that I suggest that this isn’t a totally alternate reality, but rather a distorted reflection on human existence. I think of the Borderlands as a sort of mutated Arcadia, a place of paradise that existed or will exist on Earth, but is always out of reach. The Borderlands themselves very directly reference natural landscapes that we can see on Earth. The trees and plants that surround me often find their way into the world that I depict, and I’m always gathering reference material whenever I travel. I even have illustrated field guides stacked around my studio. However, in order to create a sense of mythic distance, I always try to retain a certain feeling of unreality in my paintings. LB: And to follow on in a similar vein, in your mythology, do the Border Creatures exist in a pre-human time or do they exist in parallel to us? Because I thought it was impressive that the Border Creatures are clearly on board with Copernicus, having worked out that the Sun is at the centre of the solar system! AC: I try to maintain a certain amount of ambiguity in regards to when the Border Creatures exist in history, but I’ve referred to their world both as an alternate pre-history to humanity, as well as a mythic future-history. In a way, I think that the beauty of this kind of visual storytelling is that it can be both. I can speak directly to two universally human questions: “Where did we come from?” and “Where are we going?” However, since these characters so directly reflect on human existence without ever coming into contact with a “normal” human figure, I’ve never thought of them as existing in the present. LB: I understand you recently read Neil Gaiman’s new book, Norse Mythology – which I remember because, coincidentally, I was reading it at the same time. In carving out the narrative of the Border Creatures, have you drawn inspiration from any other mythologies? For me, there is something wise and all-knowing about the Border Creatures, and their peaceful demeanour and prowess with the natural environment evokes ideas of the Vanir from Norse Mythology. It made me wonder whether you imagine the Border Creatures living in a parallel – but connected – realm, much like the setting of so much Norse mythology. AC: Yes, a parallel but connected realm; that’s what I’ve been trying to describe. Much like how the nine worlds of Norse mythology reference elemental qualities of the physical world without being places you could necessarily travel to. When I first started painting this fictional race of creatures, I was much less concerned about the structure of myth and narrative, but I’ve been thinking about this more and more over the past year or so. Recently, I’ve been re-reading Ovid’s “Metamorphosis,” and examining nature-myths in particular, but I’m not sure if this research will manifest directly in the work or not. Up until this point, I think the epic scope of classical mythology has been absent from my paintings; as I pointed out, not too much actually happens when you’re living in a Golden Age. The questions I’ve been asking of myself have been about the daily lives of my characters, akin to examining the mundane daily activity on Olympus, or what the Vanir might be doing on an off-day. But recently, albeit mostly in my sketchbook, I’ve been questioning what comes next, or even what came before. I think the story of the Genesis of the Borderlands, or the Fall of the Border Creatures could be entire exhibitions in their own rights, but I’m still on the cusp of deciding where things will turn next. LB: It could be said that the world of the Border Creatures resembles an Eden or Garden of Paradise. Do you think about it that way? When I see Snake Gardener with her orrery, her companion snake, and the apple by her side on the table – which has a bite taken out of it, by the way – it evokes some of the symbology from the Christian book of Genesis: perhaps Snake Gardener, who appears to be a scientist, has been tempted to take a bite from an apple from the tree of knowledge. Which, of course, would be deliciously ironic, because we all know what the Church thought of Copernicus and his newfangled theory which jettisoned the Earth from the centre of the universe! Do you think this is an open interpretation of the painting? AC: Certainly! The religious symbolism in this painting is meant to be ironic, given the Eden-like qualities of the Borderlands. The Border Creatures live in a symbiotic harmony with the Borderlands, and I occasionally hint that they are an extension or natural outgrowth of the world around them. So Snake Gardener’s inquiry into the nature of things is less of a trespass than a natural function of the landscape; she is the natural world examining itself. This quest for knowledge is a recurring theme throughout “Sensory Garden.” Painter, Maker, Big Thinker, Big Dreamer, Glow Gardener, and Snake Gardener are all using the means available to them in order to better understand and connect with their surroundings. In “Snake Gardener with Orrery,” I referenced Enlightenment images of early scientific experiments and, specifically, the work of Joseph Wright of Derby. The work that I was studying exemplifies a problematic perspective on nature that persists today, one that elevates and separates the rational mind from the natural world. In contrast, Snake Gardener is using her experiment to forge a connection. Caught up in the wonder of discovery, she has become a bridge between earth and sky; the scientist stands in rapture, her head rising above the treeline to touch the stars. LB: Books are another recurring motif in your paintings (and you paint them gorgeously, I should add): sometimes they might be filled with text, other times they might be empty books awaiting filling… and sometimes the pages might be torn out and crumpled in frustration. Is this a statement about the importance of the pursuit of knowledge and the fundamental desire for us to make sense of the world around us and to pass that knowledge on to those who come after us? Because, really, that’s what all great mythologies were created to do. AC: One of the eternal riddles of representational painting is how to depict intangible concepts like knowledge in physical, seemingly tactile ways. It was Rembrandt’s paintings that first inspired me to introduce books as a way of addressing the Border Creatures’ search for a greater understanding of their world. In a Rembrandt painting, a book isn’t merely a prop or an allegorical symbol for abstract thought. It’s a bridge between the material world and the life of the mind, lovingly rendered so that you can almost feel your fingers brush against the delicate thinness of paper, almost hear the crinkling sound of a turning page. In his depictions of books, conscious thought is something that’s intimately connected to the physical world. So in this sense, I use my depictions of books to emphasize the possibility for knowledge, for scientific and artistic inquiry, to help us see the deep connections between humanity and the world that surrounds us. The proliferation of books in my paintings is also a self aware nod to the importance of storytelling, of myth-making. Even as I paint the saga of these tender creatures, I like to think that they’re writing their own narratives; stories that help them understand their place in the world. The precise nature of Big Dreamer’s poetry or Big Thinker’s essays remains mysterious, but they’re as important to the Border Creatures as our own arts are to us. LB: In all of your paintings, the Border Creatures always seem hidden and lost, either in isolation or in time or both, in a peaceful, unthreatened, untarnished sort of way. But in Glow Gardener with Nocturne, for the first time, we see the ocean and the horizon in the distance – which for me, implies a question of what lies beyond, and simultaneously implies uncertainty, opportunity and threat. Do you envisage any excursions or incursions… the last scene of Mel Gibson’s Apocalypto comes to mind! AC: I suspect you’re picking up on the narrative tension that I mentioned earlier! These characters have spent so long languishing in a perfect and harmonious state, that dramatic change feels inevitable. However, I don’t think the threat will come from beyond the Borderlands, but from within. But I’m only now beginning to investigate these possibilities, so we’ll just have to wait and see how things develop! LB: One last question Adrian before you head to the airport – what lies ahead for Adrian Cox? Are there any clues you might share about where you see your painting heading? AC: I’m actually in the planning stages for a new body of paintings that I’ll be exhibiting in Los Angeles next year. I don’t want to share too many details just yet, but some of the narrative potential that I’ve discussed here will undoubtedly make its way into this work. I’ll also be creating a number of larger paintings for the exhibition, so I suspect things will get fairly epic before I’m finished! When Tim first asked me to write something for WOW x WOW, I initially planned to elaborate on some aspect of my process, or perhaps speak about some of the influences in my work. But something much bigger (and more difficult to pin down) has been occupying my thoughts recently. About a month ago, I had a group discussion with my painting class about the role that beauty plays in the field of contemporary art. A number of the students made really great points about it being a tool of sorts, an instrument for seducing a viewer into caring about what you have to say. I think that this is true to some extent, but this explanation seems awfully meagre for something that countless philosophers, poets, and artists have invested entire careers in studying. And given the amount of time that I spend fussing over ornament and surface in my studio, I really have to count myself amongst their ranks. So what is it about beauty that occupies my imagination so forcefully? I’d like to present some personal musings here about this visual force that drives my work. As with most things in my studio practice, I think that the conversation has to begin with some historical context. When painters speak about the history of beauty, it’s almost always understood that they’re referring to the problematic history of oppressive representation; namely, the objectifying white-male gaze. I believe that all painters have to consider this history to be responsible image makers, and yet there’s a broader politics of beauty that’s more relevant to the conversation at hand. This is the tendency for beauty, or ornamentation specifically, to be seen as less virtuous than austere forms by right of its inherent “deceitfulness.” This has roots that go back all the way to Plato and his decision to give artists the boot when formulating his utopian republic. The idea is that if appearances sometimes lie, then seductive appearances are even less truthful. What’s more, the language that’s been used to condemn visual extravagance has almost always gendered the issue (one of the clearest examples of this kind of language can be seen in the shift from Rococo extravagance to the patriarchal dogma of the Neoclassicists). Ornament isn’t just deceitful, it’s also more effeminate. If this raises red flags for you, you’re not alone. This historical context matters because, in my experience, this kind of bias still exists today, even if it’s not explicitly stated. When I was in grad school, I was making work that was incredibly intricate; these paintings were overflowing with visual information and intense colors. I kept having visiting artists come into my studio and tell me, “Well… your work is very beautiful.” Which, although it sounds nice, was always intended as a backhanded compliment. The implication being, your work is fun to look at, but I don’t believe that you’ve spent much time considering what it means. Since I was invested in surface and ornament, all the ideas had to be surface-level as well, right? Here we see the crux of current biases against beauty: works that are beautiful are seen as being shallow. But I view beauty, and ornamental beauty in particular, as a form of visual praise, of celebration. As something that requires you to see the limitations of skill that box you in, and to proclaim that the box isn’t big enough, that you have to overcome yourself to achieve a form worthy of your subject. To wrap something in the most visually decadent veneer possible is a way of praising the subject matter and elevating the meaning, rather than flattening it. There’s not too much room for irony in my work since I think about beauty in this way. Humor, certainly, but I’m never insincere in the visual praise that I give my subjects. The empathy that I feel for the monstrous characters that I’ve created is very real for me, and this is part of the reason that I spend so much time striving to cloak them in beauty. I also believe that beauty enriches and deepens the experience of viewing a work. When I speak about my paintings, I often discuss how I intend the image to be analyzed and read; the narrative components, the specific historical references. But I think there’s something else beyond this rational way of approaching a work of art, a way of viewing a painting as a catalyst for a certain kind of encounter rather than as a passive image. I’m arguing that we should make room for an experiential relationship with works of art. This is something I think about often, creating works that are meant to be read, but also to be felt on a level that’s almost akin to physical sensation. Beauty is bound up in this experiential read by threads of desire. A truly seductive image makes you want to lose yourself in the work, to enter the painting completely. The ineffable goal of my entire practice lies somewhere between a conceptual read (elevated by ornament) and an experiential encounter (enriched by desire). If it sounds like I’m being vague here, I apologize; this is the event horizon for verbally articulating this idea. But I know that there’s something in great works of art that allow them to remain an active force through the ages, and not just passive artifacts. Beauty guides us into the depths of these works, and at the core of this depth, between meaning and feeling, lies wonder. Wonder is the elusive goal for artists, seen only in brief glimpses, and seldom where we expect to find it. It lies between rational thought and pure sensation, the bridge between surface and depth. It is the stuff dreams are made of, and it fills my imagination completely.